Don’t know how to dress casually for class and internship? If you’ve been keeping up with my previous blogs, then you know we’ve discussed what you should wear to work. I thought it would be helpful to give you all a visual representation of what to wear. If you’re able to dress casually at work then this post is perfect for you. I know a lot of people who feel more comfortable wearing jeans to class than a dress or dress pants. Somedays you can go to class and then go straight to work and you don’t have time to go home and change. This infographic shows what is comfortable and accepting to wear to class and work for both men and women. Men: jeans are always a go to. They match with everything. For a top, you can wear a sweater or a pullover. If you don’t want to wear this to class then you can wear a t-shirt to class and before you go to work put the sweater or pullover on. When it comes to shoe’s sneakers are fine as long as they are clean. You don’t want to be going into meetings wearing dirty sneakers. No one would think that you are professional. A nicer dress shoe is fine too. What to Wear and How to Wear it shows different outfits for men that they can wear to work. This is a great source because it not only gives casual outfits but also professional outfits. Women: just like I said for men, jeans are fine. Women have a lot more options when it comes to dressing casually. For a top, you can wear a sweater, a nice shirt with or without a cardigan, or just a long sleeve shirt. As for shoes, you can wear flats, boots, or booties. If you wanted to dress it up a little you can add bracelets, necklaces, and earrings. These aren’t the only options. Business Attire for a Casual Workplace lists pictures with descriptions for outfits that are appropriate for class and your internship. Leave a comment if you have any questions or tips on dressing casually for class and your internship! Communication is key. You want to keep open communication with not only your employer but also your professors. As most of you know, a lack of communication can lead to a messy situation. Sometimes you can forget to inform people about things and sometimes that can be okay, but when it involves your professors and boss(es) that’s a whole other thing. If you have an event for your internship, make sure you inform your professors about the event. If you feel like you are falling behind in school work and you’re stressed let your boss(es) know. Most of the time they will be understanding if you are just open and honest with them. Having a good relationship with your professors and boss(es) is a great way to keep open communication with them. There was a time when I felt really behind in schoolwork and I just needed a day to get all my work done. Having class twice a week, an internship at least three times a week, and working another job on the weekend leaves time for school work and friends very limited. I explained the situation to my boss and asked if I could just work in the morning and she was very understanding. She’s been in my shoes before and knew exactly what I was going through. By having a good relationship with my boss and open communication I was able to work a half day and then do all my schoolwork. you and be prepared for them. Show value. Show them that you will come in earlier or stay later at work one day. Show them that you will get the assignment in as soon as possible. Forbes wrote an article about improving your relationship with your boss which can help in your internship and school. One other situation I have come across with miscommunication is between two of my supervisors. I was told one thing by one supervisor and another thing by another supervisor. When I was stuck in this position I wasn’t really sure what to do. I ended up talking to my supervisor in charge of the event and he got everything figured out. This was another case in where I had to use good communication to let me supervisor know why I was so confused. Communication skills for workplace success talk about top ten communication skills. The one skill it talks about that I find important is picking the right medium. I personally think that in any situation where there is miscommunication it is best to talk in person. What are some situations where you have experienced miscommunication? Just being a student can be a lot. Now you’re adding an internship on top of your schoolwork. It sounds like it’ll be a lot and very stressful, but you’ll get through it. I remember when I started my internship at the Greater Cleveland Sports Commission (GCSC). I was working there for two weeks before I even started classes. My first week at GSCS was crazy because we were getting ready for an event the next week. The week of the event was crazy. I thought to myself how am I going to handle an 18 credit hour course load, have an internship, and still work another job on the weekends. I honestly had no idea how I was going to manage it, but I knew that everything I had on my plate was going to be worth it in the end. Staying organized is the main thing. If you don’t have a planner get one. If you do, make sure you write everything down. I’m the type of person that writes everything in my planner. I also have a sticky note on my computer screen that says what I have to do that day. Above my desk in my room, I have a white-board that has bigger assignments written on it. Yes, I know this may be excessive but it’s what helps me stay organized. Check out 45 Tips on Staying Organized in College on how to stay organized during a crazy year. Everyone has their own way of staying organized and this might not be it but find what helps. Staying ahead on school work is another way to stay organized. If you have an event coming up at work, you don’t want to be doing homework after the event. After a long days work, the last thing on your mind is school. This is why it’s best to work ahead. Wouldn’t you rather spend a whole day doing homework than going to an event all day and doing school work after? This also lets you enjoy the event. The day of you won’t be stressing over what assignments you have due, and you’ll be able to enjoy the event. Make time for yourself. T his is a huge one. You can’t devote your entire semester to school and work. Yes, those things may be your priority, but you have to make time for yourself. You need time to relax. You need time to not think about anything else that’s going on. At least once a week you need a day to hang out with your friends or do something you love. This is something I realized later in my busy schedule. I was constantly stressed and constantly worried about what I had due in school and work. I finally realized that I had to make time for myself. That time is usually Friday or Saturday night. Make More Time for Yourself talks about making time for yourself and what you’re going to do in that free time. 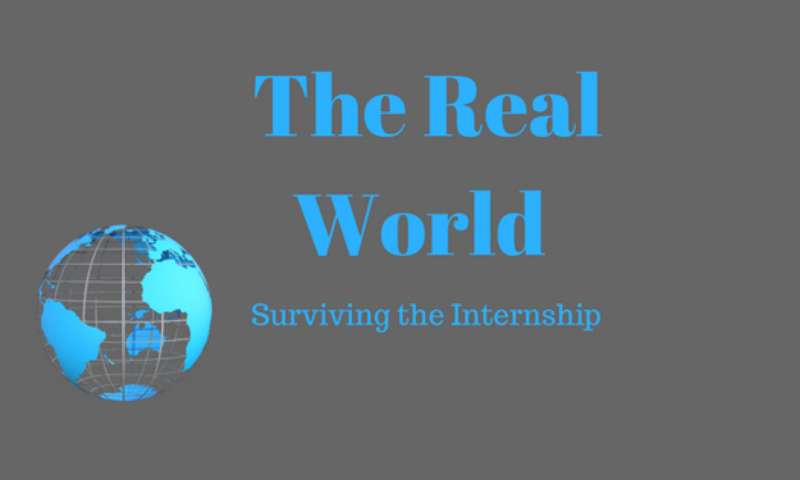 All of these things I learned while doing both, but hopefully this will prepare you for when you have school and an internship. I understand how hard and stressful it can be at times, but I wouldn’t change it for anything. Tell me some tips that help you survive school and an internship! It’s the first day of your new internship. How are you feeling? Nervous? Apprehensive? Excited? Confident? It’s totally normal to feel all of these feelings. I’ve never met anyone who wasn’t a little nervous or anxious about starting a new job. I remember the first day I started my internship. I was super nervous, but once I got there and met everyone I knew that I would love coming to work every day. Here’s a list of things to remember for the first day of your internship. Be on time. On your first day, you don’t want to show up late. If you aren’t sure how long it will take you because of rush hour to get there on time then leave even earlier. You would rather be there early than late. By showing up late, it’s going to come off as if you don’t care. On my first day, I showed up about 25 minutes early. Even though this was super early, I was able to use this time to relax. I used this time to think about any questions I had for my boss. Dress professionally. You should always dress professionally the first day. If you are told to dress casual, I would still dress professionally. You don’t know what that company defines as casual or professional. So until you know and see what other people are wearing, dress professionally. I was told to dress business professional for work, but when I got there I found out there they dressed more casual than professional. Check out this link to get some ideas on what to wear. Ask questions. There’s no such thing as a stupid question. You may not be the only one questioning something. By you asking the question, you could be helping other people out too. On the first day, you are learning the ropes and going over the handbook. If you have questions about anything, now is the time to ask. Take notes. While you’re going over the handbook, it’s okay to take notes. It’s actually encouraged. This shows your boss or supervisor that you’re listening. This isn’t just something you should do for the first day. You should do it anytime you have/attend a meeting. These are just a few of the things that will help you survive the first day of your first internship. These shouldn’t just apply to your first day but to every day. Check out these websites for more advice on how to survive your first day. DO you think having your phone out during work is okay? Click this link to read why you shouldn’t have your phone out. Check out her campus and read about why you should get to know people at work. Thanks for reading my first blog! What are some things that you guys want to read about? Leave a comment in the comments section I’ll make sure to blog about it!